This week we sewed pillows. On a whim....well on a four year old's whim who went with me to Jo-Ann's to get more fabric for the goldfish quilt and "discovered" hey they have Tinkerbell Fabric here. She was so cute, she carried the bolt of fabric up to the cutting counter all by herself, and it was almost taller than she was. 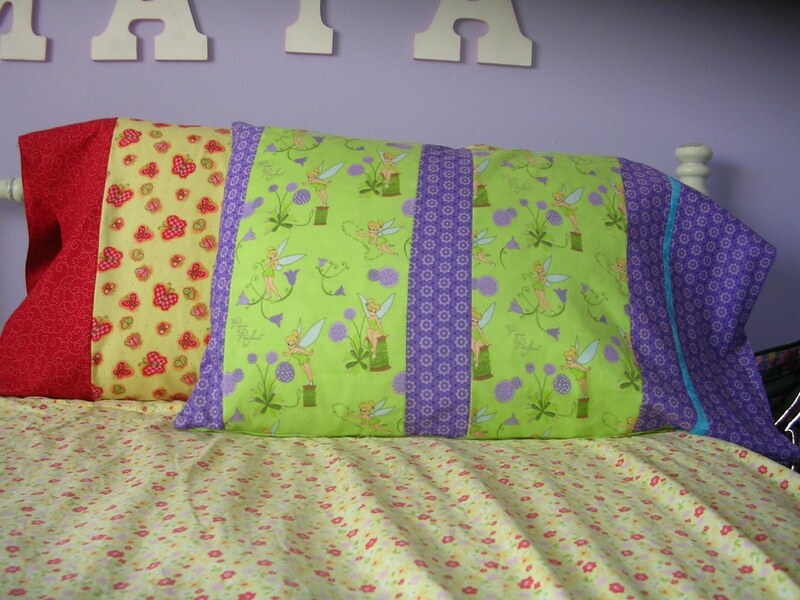 So above is the finished project, one for big sis and one for little sis. 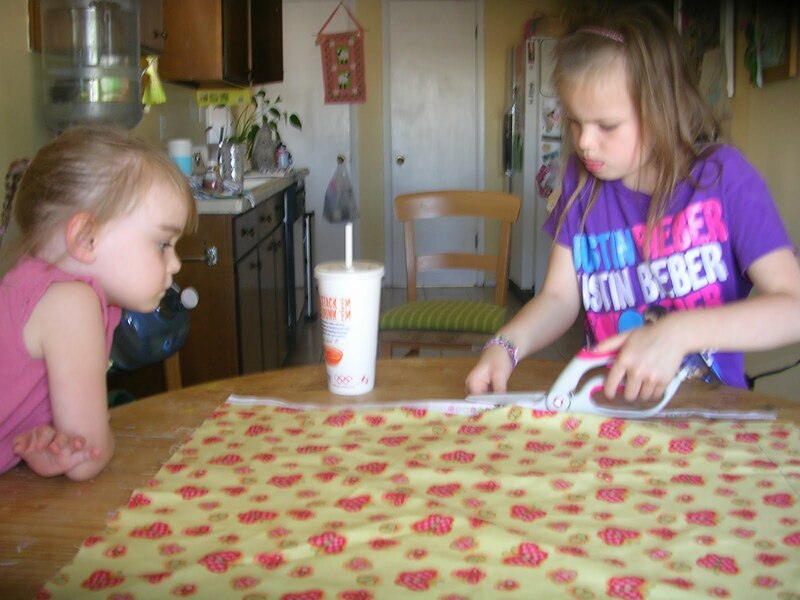 Big sis got to help with the making of the pillows. She actually did really good. 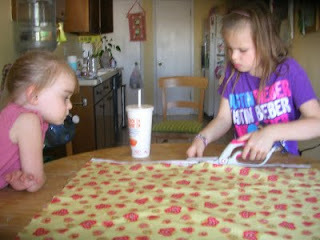 I let her cut the fabric with my fancy quilting scissors (not ready to hand her a rotary cutter yet). I sewed the first line then, and she followed it with a 2nd. 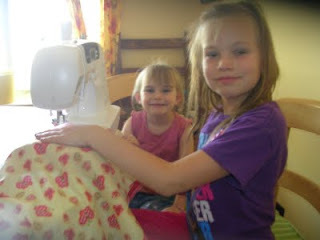 She even worked the sewing machine all by herself, pedals and all. So it was a fun little project. These are the two giveaways I won that arrived last week. Too pretty, I was so excited to see these two packages arrive in my mail box. 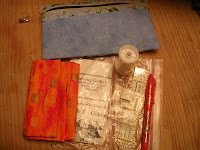 Marj of the Eclectic Quilter send me the cutest little knick-knack bag, and included a beautiful orange fabric that will go perfectly in my goldfish quilt. So thoughtful. And Nataly of Nataly's Needle Creations sent me all the awesome cross stitch loot on the left. 3 pieces of linen, 2 great charts, a whole bouquet of thread, and the little sewing scissors (who can ever have enough scissors). 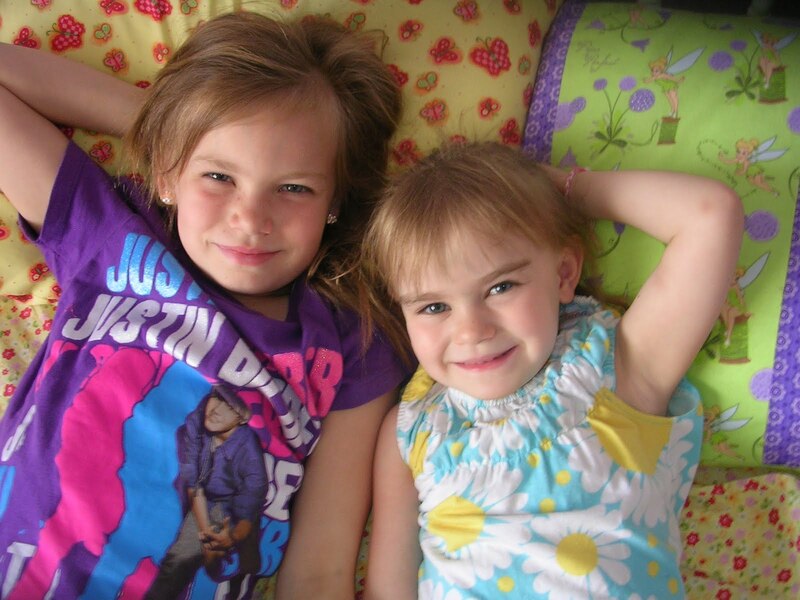 So I wanted to say a great big THANK YOU to both of them for brightening my whole week. WOW! 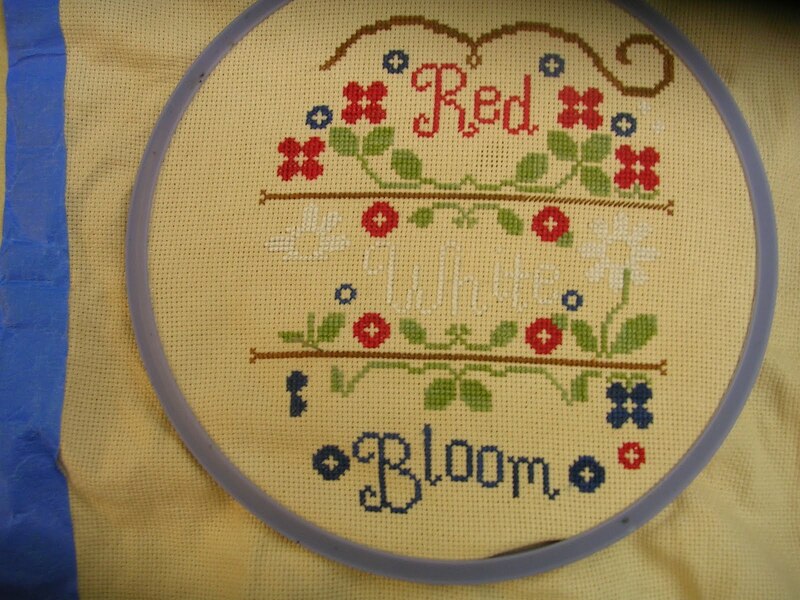 This is my teeny tiny, barely worth showing bit of progress on Red White and Bloom. 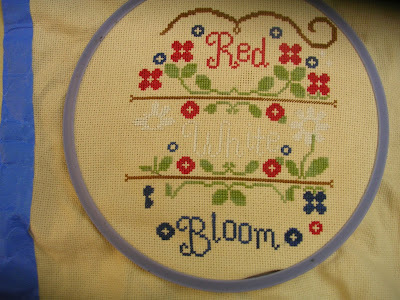 The white is not popping as much as I would like, but I really want to get this done and hung before July. So I am accepting what I don't want to change and hoping once it's framed I will still love it. 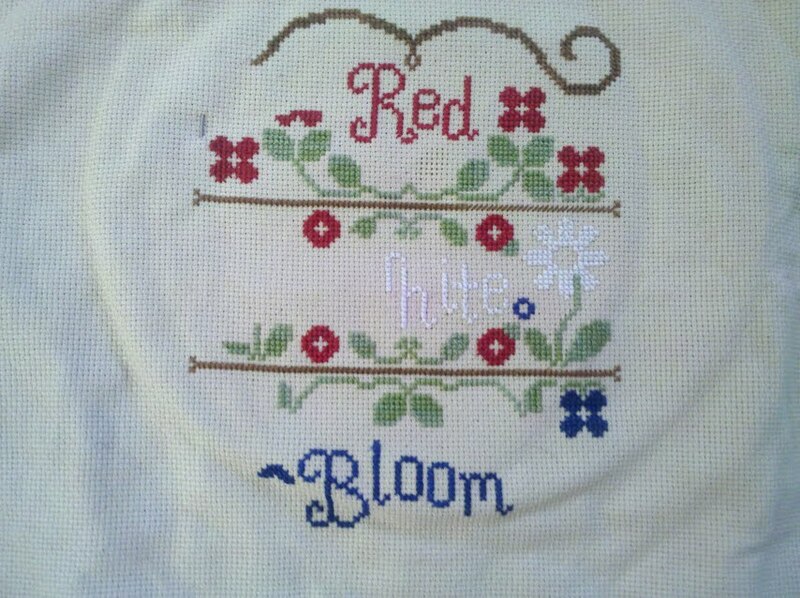 If not I'll take it down and re-stitch the white in time for July 2012. 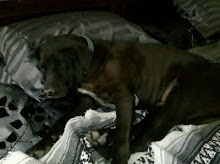 And I know last post I said I also wanted to do a blog give-away since I have been so blessed. So this is a sneak preview, next post I will announce the full give-away. I think I will finish this as a cute ornie with the fabric underneath it, and of course toss in some other goodies with it. So check back later this week. 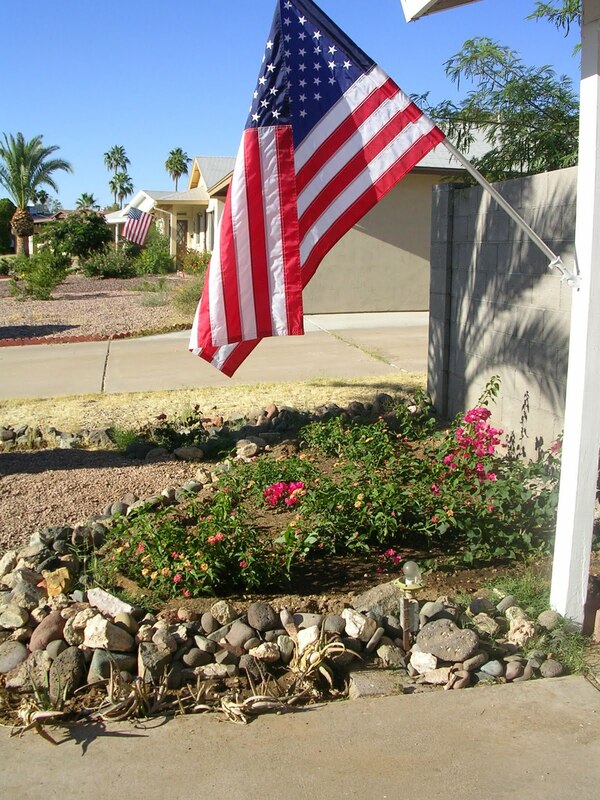 It's triple digits here all week, so where ever your reading from I hope your summer weather is cooler than ours! 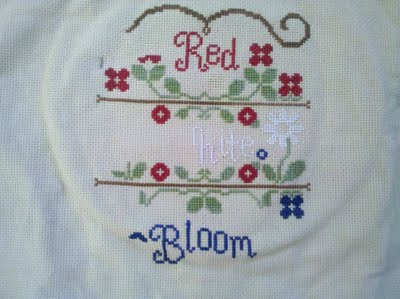 Above is my very little progress on Red-White-Bloom. I'm thankful there's still a few more weeks in June to get this one done, my stitching mojo has slowed down a bit on it. I have been having a lucky week on other people's blog giveaways though. 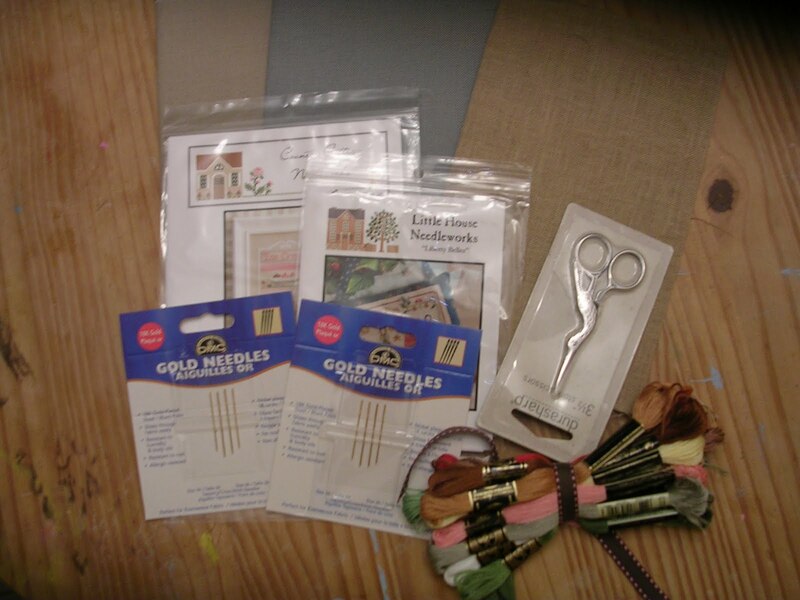 I won Nataly's blogiversary giveaway, of Nataly's Needle Creations. 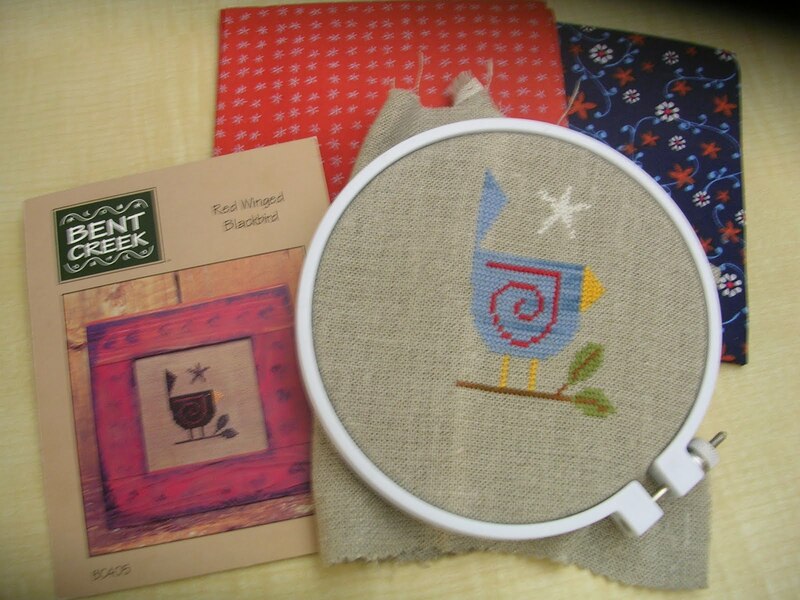 Two cute charts and linen/thread to go with them. Congratulations Nataly on 1 year of blogging. I also won Marj's blog giveaway from the Eclectic Quilter, which was a cute little knick-knack bag in the prettiest blues/pink. Now I think I may have to have my own blog giveaway, since I have received so many wonderful things from other peoples. Details next week (i'll have to work something up first! I have a cute idea in mind). 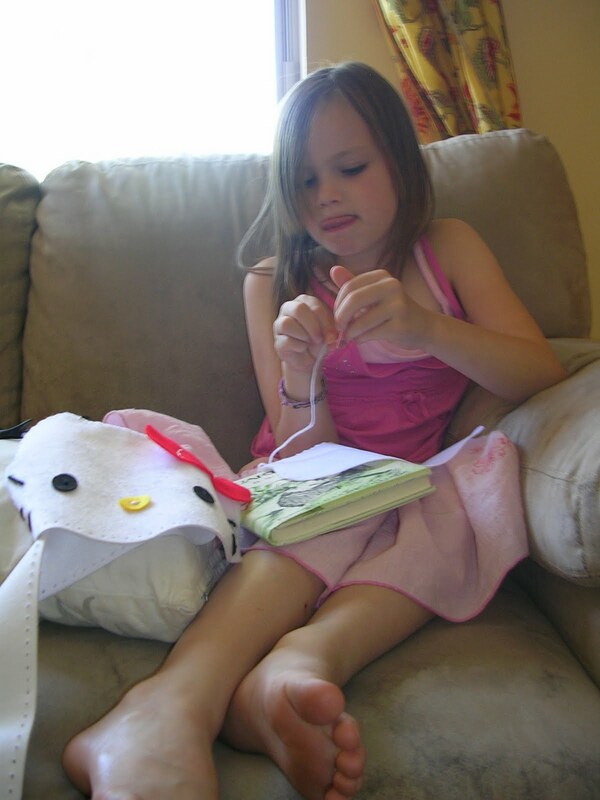 And this is my oldest stitching away on one of her own projects. It's a Hello Kitty purse, out of a kit from Jo-Ann's. The kit said for ages 6 years and older, well she's eight and let me tell you some of the directions confused even her 30-something mom. 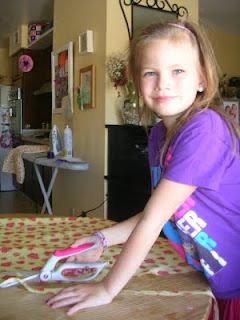 But she really liked all the sewing involved, all the pieces were whip-stitched together with yarn, so that was easy enough for her to do on her own. 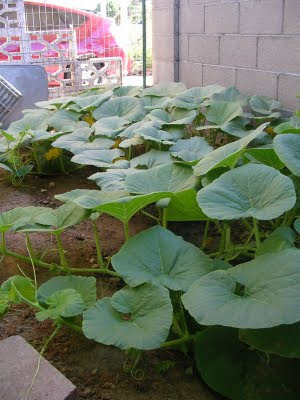 And these are some pics of my growing garden. This is my pumpkin patch. I have one little tiny pumpkin started already. The bud is a little bigger than a quarter. The vines on these things grown at least a foot a day, it's awesome to watch. And this is my desert flower garden, lantana and bougainvillea. The hotter it gets here the more they bloom. And the lantana will eventually spread and cover the whole bed, while the bougainvillea will grow up and cover my lovely block wall fence. 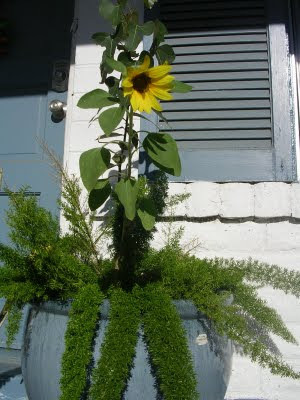 And this is a misplaced sunflower growing on one of the fern planters on my porch. In front of the porch we planted a bed of sunflowers (see below), and I think little hands may have strayed and planted an extra seed amongst the ferns. 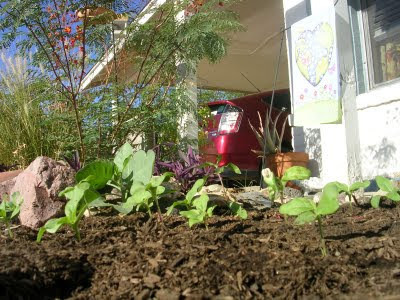 These are the rest of my sunflower seedlings. Eventually these will grow to be 6 ft tall (I hope). They are already growing really quick, they've only been in the ground about a week now. Thank you everyone who answered my over-one question. I love to look at (ok drool over) everyone else's lovely/gorgeous/sparkly-beaded Mirabilia finishes. But every single time I would puzzle over why/how they stitched the faces over one. It makes sense now, though i'm not sure I am brave enough to ever try it. Have you ever had a fabric in your stash that you love so much that your scared to use it? 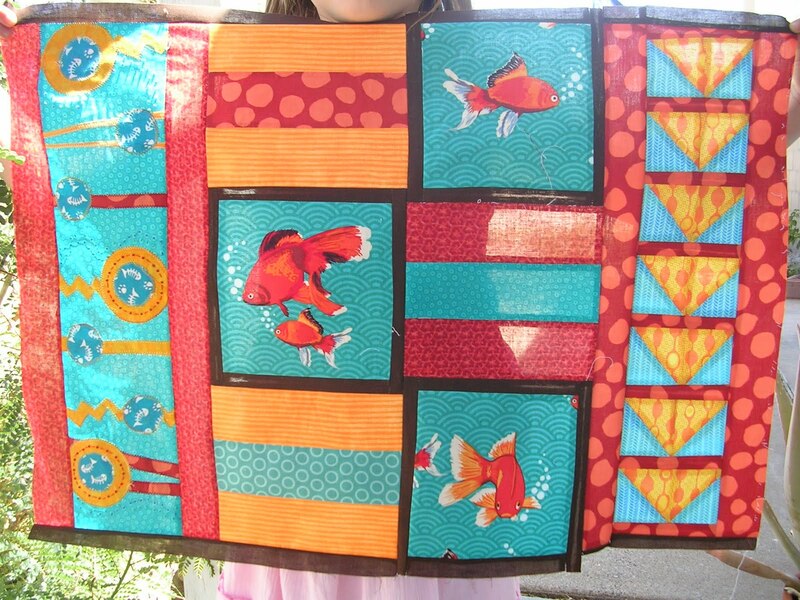 The goldfish fabric above is that one for me. I bought it back in October from a quilt shop I don't normally frequent. And I LOVE it. 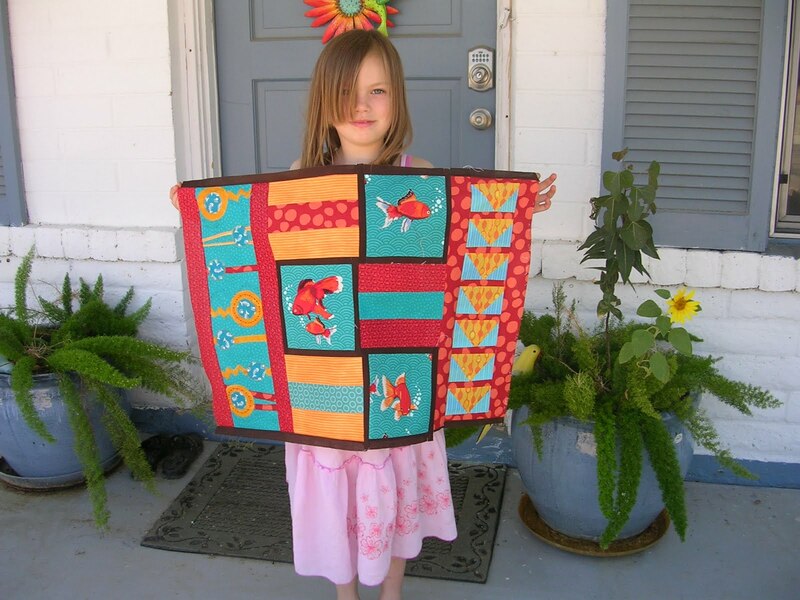 So much so that I had to remind myself it wasn't doing any good sitting on a shelf, and if I never used it my children would eventually sell it at a yard sale after I was to old to sew. 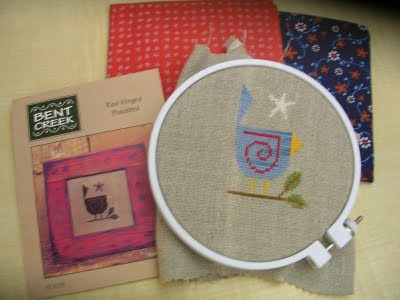 So this has been my playtime for this week, making a small wall hanging with my favoritist fabric. 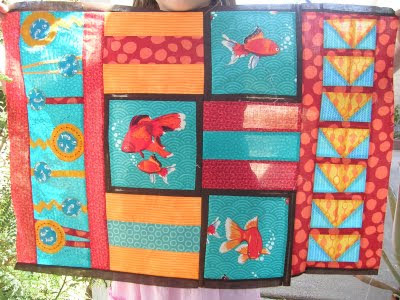 No pattern on this one, I just really wanted to feature the cute gold fish. So I have been adding bits and pieces as I go around the center 3 blocks with fish. On the left panel, the small blue circles have fishy skeletons on them and I did some beading around them last night. (Note to self don't bead before the quilt top is finished no matter how excited over it you are).